Our mini reunions are underway! Below we are posting reports of classmate gatherings that have taken place with the most recent at the top. When we receive details of upcoming events, we will post them on this website. Thanks for your notes and pictures and to all the organizers and participants. Let's hear more. 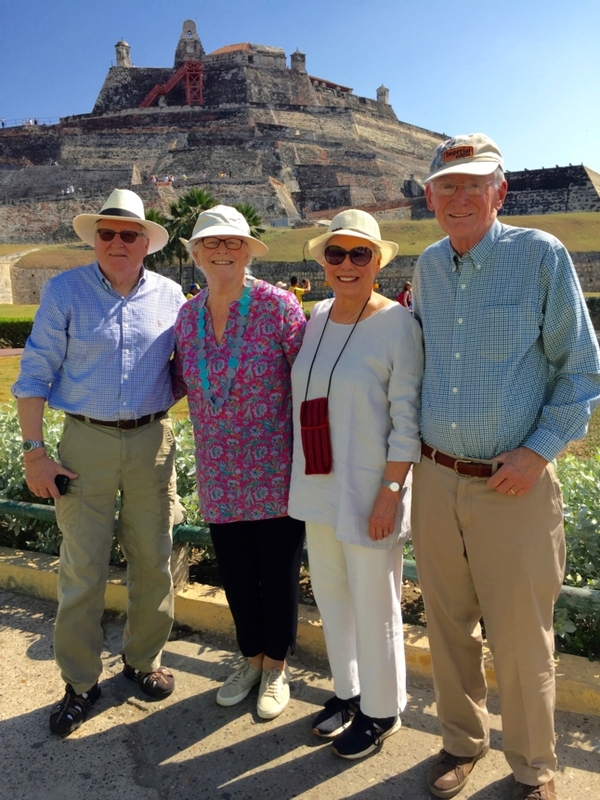 Alice and Colby Andrus and Mary Ann and Ted Weiss celebrating Alice's birthday in Cartagena, Columbia. Our fourth annual mini-reunion brought us from six states—Connecticut (Ginny Johnson Potter), New Jersey(Cindy Prescott Hedin), New York (Lindsey Reber), North Carolina (Jane Bruce), Vermont (Julie Touchette Lavorgna), and Wisconsin (Karin/Kitty Torgerson Randolph)—to enjoy a stimulating five days together in New York City. The short sleeve/sandal weather made walking and dining al fresco a pleasure, and we made the most of it, visiting the High Line, the Battery Urban Farm (complete with labyrinth), the Goldsworthy Garden of Stones (with a break for fabulous chocolate babka), Alexander Hamilton’s tomb at Trinity Church, and the stunning Conservatory Garden in Central Park at peak fall bloom. We wandered near the World Trade Center memorial pools and were amazed by the wing-shaped mall. During a tour of Lincoln Center two of us were handed free orchestra tickets to a dress rehearsal of the new Tristan with Nina Stemme, while the others went on to the Museum of Arts and Design. We returned on another day to see a Balanchine/Stravinsky program by the New York City Ballet. We also managed to take in Taryn Simon’s installation ‘Mourning’ at the renovated Park Avenue Armory as well as the dramatic Rubin Museum, sampling the Himalyan menu at the attached Café Serai. A special treat was a ride in the Sea Glass Carousel at Battery Park, preceeded by pizza on the waterfront and followed by a trip on the Staten Island Ferry. We split up to visit our favorite museums, including the Cooper Hewitt with its new and remarkable interactive offerings, the Metropolitan Museum of Art, and the Guggenheim. Food in New York is always fabulous—we enjoyed Indian, Mexican, and Italian as well as fusion on this visit. We’ve already started our list for next year! June 8, 2016 Brunswick, New Jersey mini-reunion luncheon at The Frog and the Peach.... names on the way. Back Row: Alice Godfrey Andrus, Ruth Brown Gramlich, Peggy Linn Slatkin, Joan Cox Danzansky, Tracy Philbrick Truman, Nancy Welker, Gretta Powers, Kathy Vreeland Buffon. Front Row: Roz Pratt Mack, Hester Lindabury Ohbi, Caroline Keith, Melissa Craig Parham, Sally Donner. March 2016--Silicon Valley Desitination Reunion participants. What a terrific group! Dinner at Fornaio during Silicon Valley mini reunion. April 27, 2016. 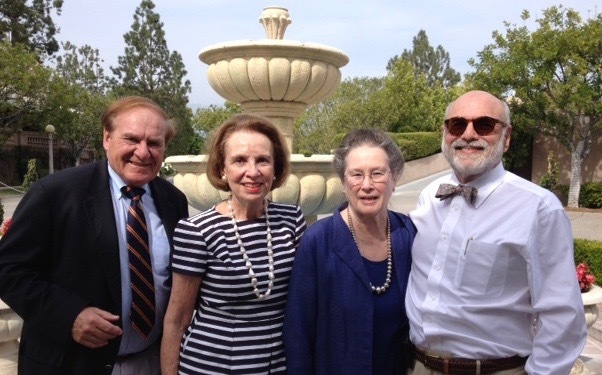 Ellen and Peter Boer and Elizabeth Short and Michael Feldman mini in LA. 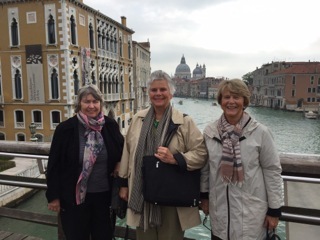 Here are Barbara Randall Preuss, Dorothy Davis and Marianne Banning Adey at their Venice mini-reunion where they took in the Venice Biennele, posed by the Grand Canal and celebrated friendship with an Aperol spritzer, Venice’s favorite aperitif. Stunning ladies! In October Lindsey Reber, Karin (Kitty) Torgerson Randolph, Ginny Johnson Potter, Julie Touchette Lavorgna, Cindy Prescott Hedin, and Jane Bruce converged from upstate NY, Wisconsin, Connecticut, Vermont, New Jersey and North Carolina to enjoy our third annual mini-reunion in New York City. The weather was unseasonably warm and sunny all week, so we were able to enjoy lots of time outdoors—star gazing with the NY Astronomical Society on the High Line, walking across the Brooklyn Bridge followed by a visit to the Brooklyn Botanical Gardens, a walking tour of the East Village with Big Apple Greeters (and a visit to the nearby Ukrainian Museum), a sunset supper on the terrace at Battery Park, and a tour of the New York Botanical Gardens including the reconstructed Casa Azul of Frida Kahlo. In addition we visited MOMA, the National Museum of the American Indian and the Tenement Museum, and had dim sum in Chinatown and cannoli in Little Italy, as well as wonderful meals in French, Italian, and German restaurants. The opening gala of ABT at Lincoln Center was a special treat for five of us (the sixth went to hear jazz at Birdland instead) as was a visit to General Seminary with a tour of the ‘new’ library with its rare book collection, of special interest to our two librarians. We are already looking forward to mini-reunion 2016! 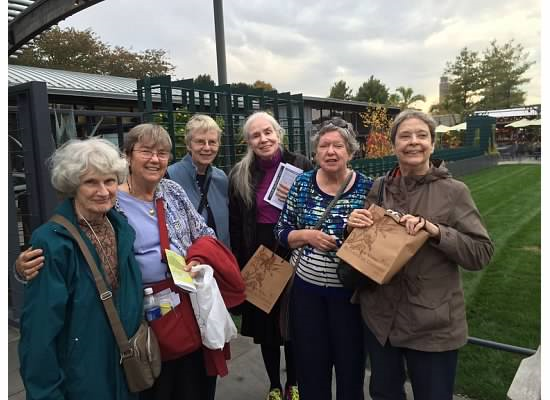 On September 30, New York and Connecticut classmates gathered for a luncheon and tour at The New York Botanical Gardens in the Bronx. After catching up with each other and with news from college at lunch, we toured a re-creation of Frida Kahlo’s home, studio and gardens. Amid eye-popping displays of tropical flowers, palms, cacti and succulents, we were transported to sunny Mexico. Attending were Judy Mills Courter (NJ), Pam Gold Oppenheim, Emily Miller d’Aulaire, Doris Mortenson Sisley, Sara Panks Garretson, Susie Fickel Kroeger, Marge Plant Steinberg, Suzy Eberson Adams, Diane Demont Rapp, Paula Freshman Kaplan, Nancy Selinka White, Ellen Strauss Boer (DC), Alice Godfrey Andrus (Boston) and Paula’s guest, Jennifer Allan Soros, ’92. 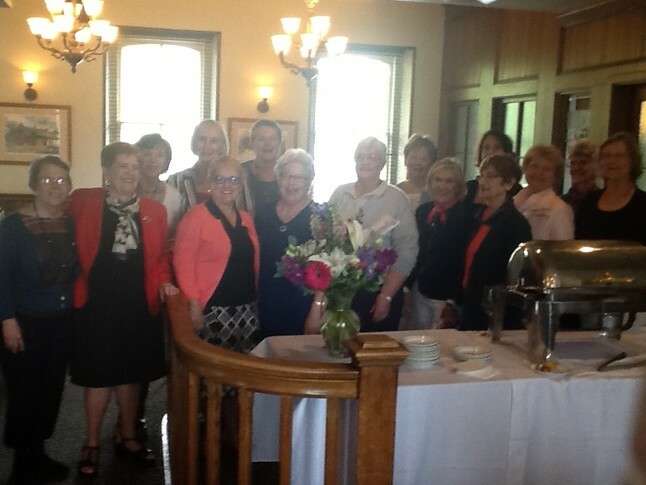 Many thanks to Nancy, Paula and Susie for organizing the luncheon and tour. 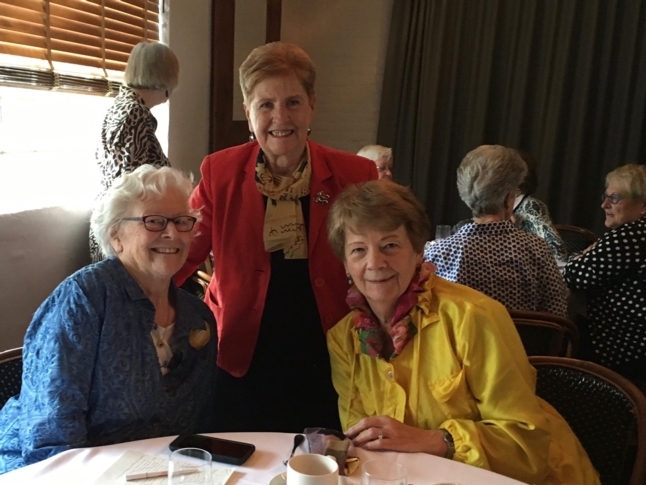 On September 16, an inaugural Minnesota mini-reunion took place at the home of a gracious hostess, Jane Tuzik Phlllips in Edina. 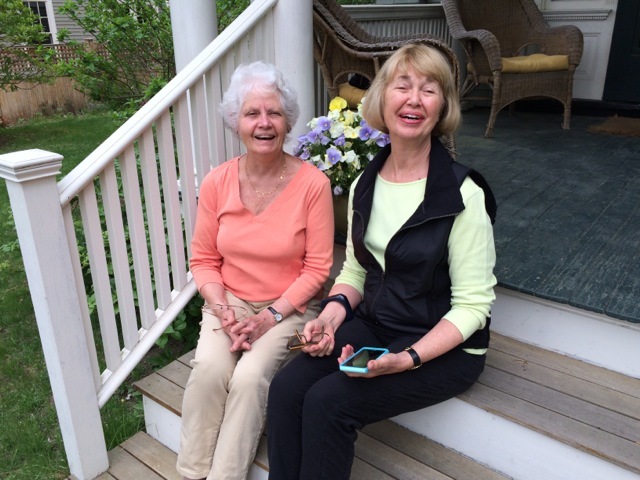 Jane made a delicious lunch of wonderful salads and we sat and talked about our 50 year history. 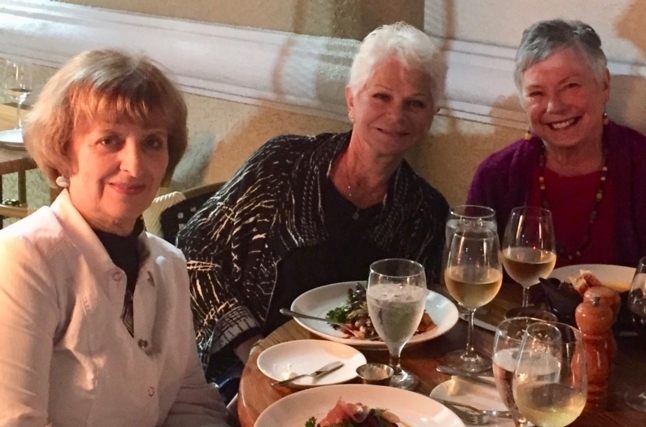 Katie summers in Ontario and Leslie winters in Tucson so there are opportunities to meet up with these fantastic classmates if you are nearby. Jane is a proud grandmother of a U of M talented baseball player. Interestingly, these folks are all Minnesota transplants! 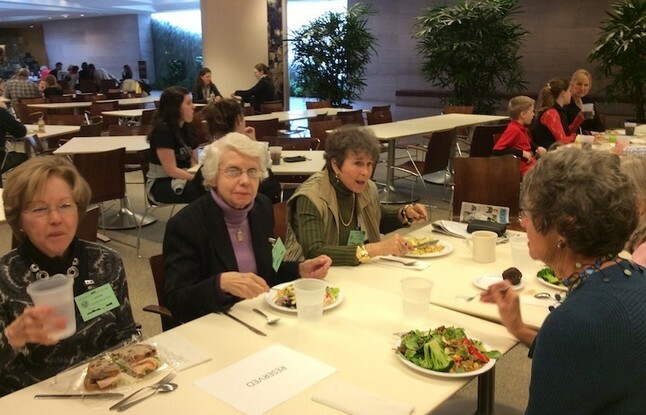 Attending along with Jane were Leslie Drisko Gardner, Katie de Ferranti Williams and Alice Andrus. 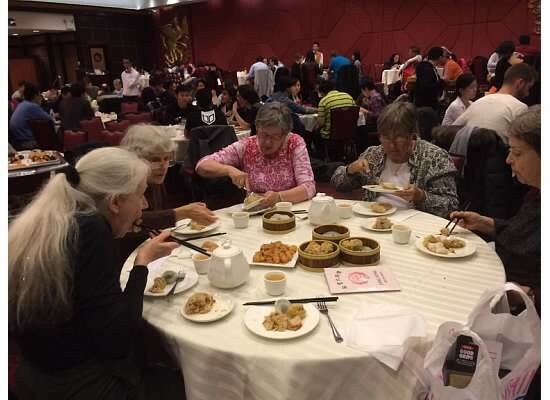 Kay Briden was not able to join us this time, but would like to get together with her classmates the next time they gather. 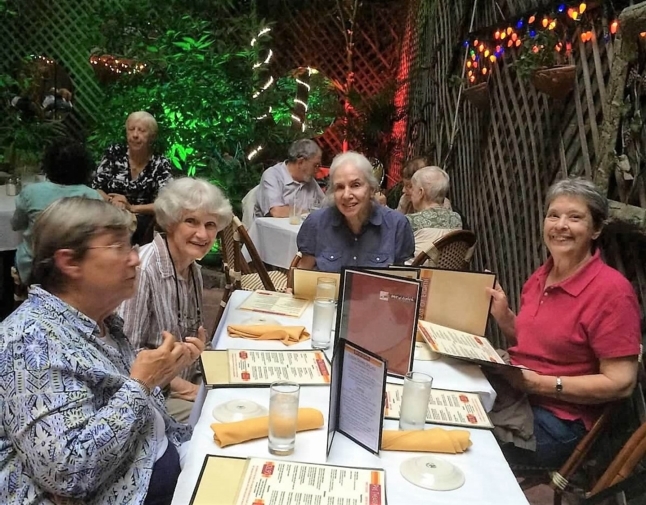 ​Lambertville, PA, was the site of a June 2015 mini-reunion which Elaine Cox Jacoby organized for Middle States classmates,. Luncheon and exploring the abundant antique shops in Lambertville was on the agenda. Plans are being made for a fall mini as well. 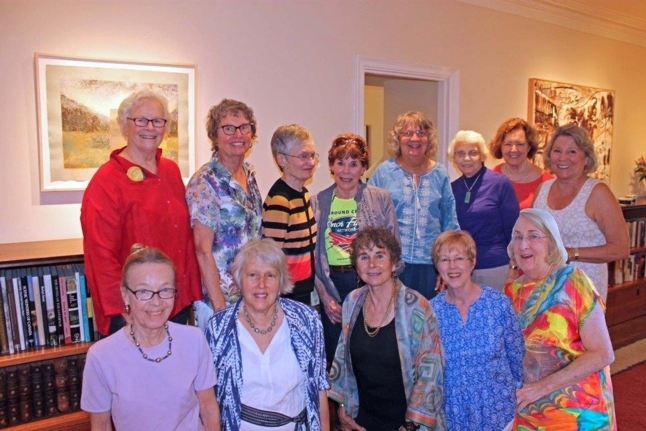 Front row from left to right: Adelaide Bennett Hagens, Elaine Cox Jacoby, Arlene Anderson Johnson, Katherine "Cassie" Lord Miller, Marjorie Quillan Wendell, Frances Fenkel Freedman, Margaret "Peggy Linn Slatkin, Suzanne Emerson Disabato, Judy Williams Irving. Back Row: Judy Mills Courter, Sandra Kenyon, Deborah Ramey Reese, Ann Sutton Kahn, Carol Greenberg Skillman, Gail Carver Ferris. 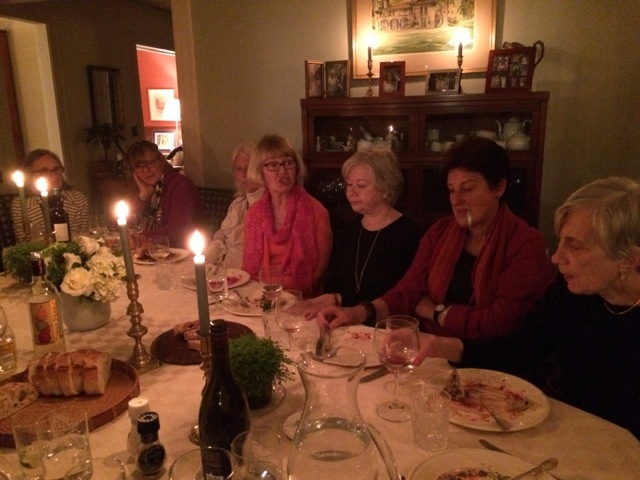 These four photos are from the May 15 gathering co-hosted by Lucy Carlborg Rosborough and Sally Calder Wittenberg at Lucy's home in Concord, MA. 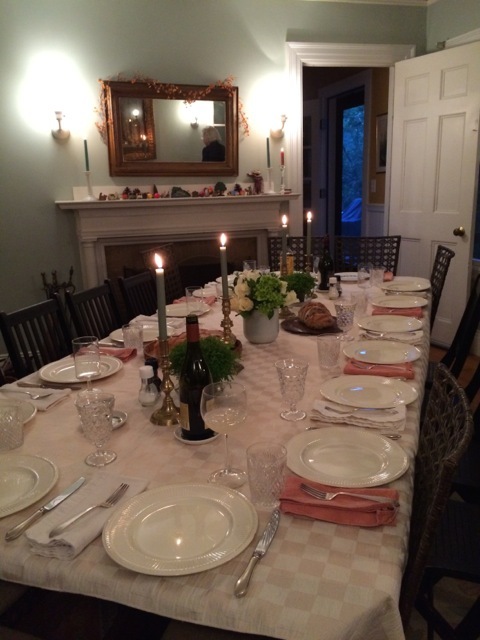 Photos show Lucy's table, classmates and the hosts. 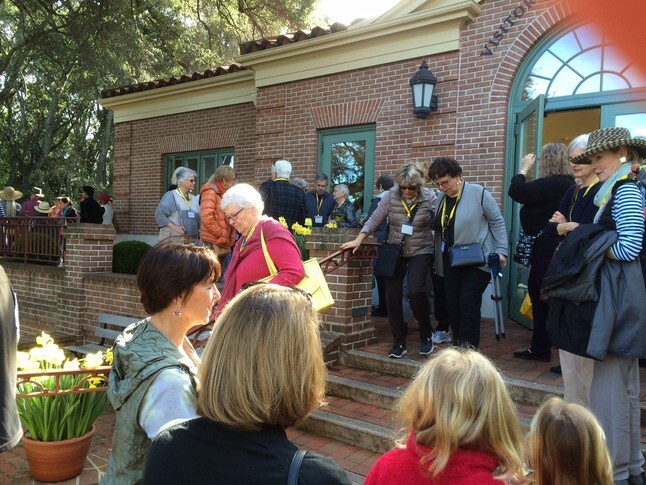 Attending were Judy Reeve, Karel Mortenson Koenig, Luise Mallinger Erdmann, Fern Mautner Beschler, Anne Stephanson Glickman, Lanie Langdon Kessler, Nawrie Meigs-Brown, Margot Solleveld Moomaw, Pat Wecker, Lil Kemp, Marjorie Muecke, Mary Ann Szporluk and Marcia Gruen Kohl. 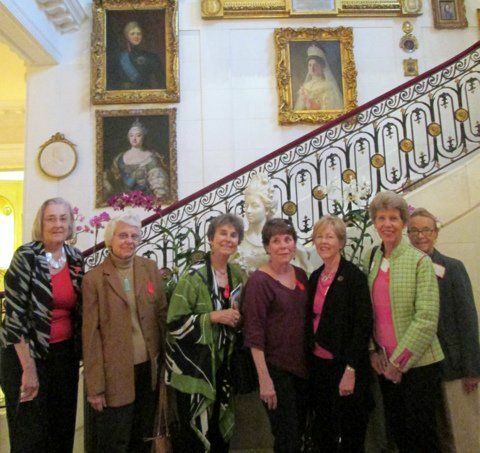 Organized by Shirley Trew Miller and Missy Craig Parham, nine Washington area classmates met for a tour of the house and grounds of Marjorie Marriweather Post's historic home, Hillwood. 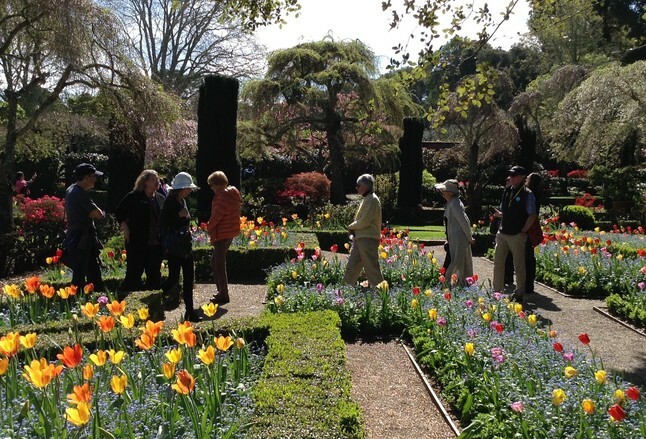 A beautiful Sepbember day allowed for the tour of the captivating gardens and Mrs. Posts role in creating them. The inside tour unveiled her collection of French and Imperial Russian Art. Following a pre-arranged lunch at Hillwood, the group toured the Cartier exhibit of Mrs. Post's fabulous jewelry collection. Attending were 63ers pictured here: Sally Donner, Nancy Welker, Carolyn Keith, Joan Cox Danzansky, Missy Craig Parham, Shirley Trew Miller and Roddy Pratt Mack. Missing from the photo are Joan Cox Danzansky and Karen Shaver Wesley. A charming Smith seven sister was their docent. 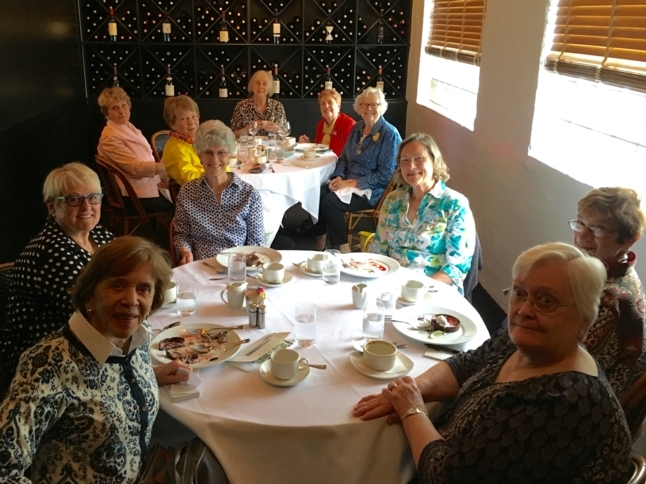 A gathering of friends from the class of 1963 enjoyed a weekend of tours (the Museum of American Illustration and Touro Synagogue), seafood on the wharf, brunch at a yacht club, visits to the Tennis Hall of Fame and walks along the Cliff Walk. There was plenty of time for discussions, gabbing, catching up and hearing about travels and classes being taken. We agreed retirement was a great time. 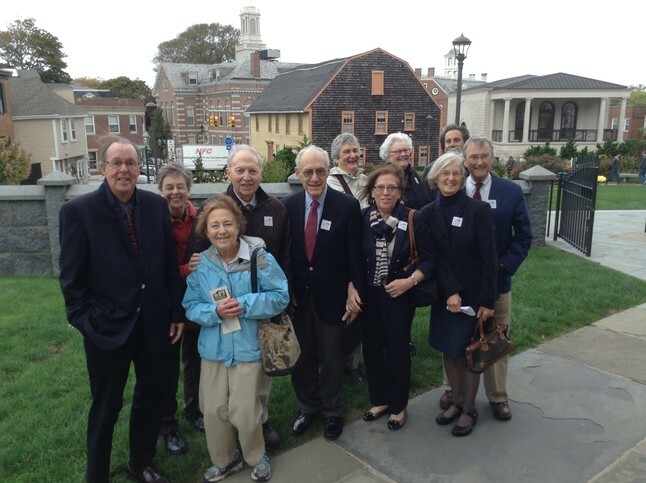 Below is a small part of the group photographed outside Touro Synagogue on a windy Sunday morning. 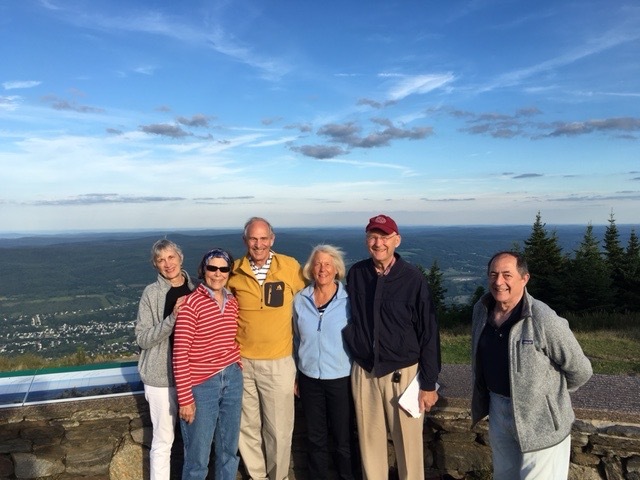 Left to right: Jenni and Mark DeWolf, Paul and Jack Kaplan, Marcia and Ralph Kohl, Karel Koenig and Bob Oakes, Helen Weinland, Alice Andrus and our guide, Lew. 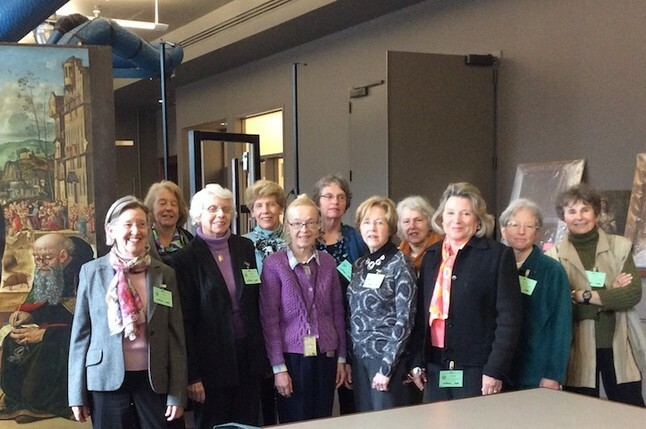 Eleven members of MHC '63 gathered in Washington, DC, at the National Gallery of Art on 21 March for an extraordinary visit to the painting conservation laboratory and viewing of selected paintings in the main gallery, followed by lunch. The day's activities were arranged by classmate Roddy Pratt Mack, a specialist in Renaissance painting who continues to work part time at the museum. After gathering near the museum entrance, we were escorted to the basement laboratory, airy and full of light, where a variety of paintings in various stages of restoration sat in frames or on tables, surrounded by equipment to support both skilled human work and technical analysis of the works. A discussion of work in the laboratory was presented by Elizabeth Walmsley, who is curating an exhibit of works by Renaissance painter Piero di Cosimo that will appear next year at the Washington museum and later at the Uffizi Gallery in Florence. Two paintings by Cosimo were in the laboratory, Nativity with the Infant Saint John (c. 1500) already restored and the Visitation (c. 1490) in progress. Elizabeth explained the processes involved in today's restorations, which usually require months to years of work on each painting. Conservators work with physical scientists, chemists, art historians and others to fully understand a painting. She discussed the effects of original media, the artist's painting techniques, varnishes, and previous restorations or layers of varnish that sometimes turned out to be detrimental. As Bunny Gramlich wrote afterward, "We were all astounded at the technical complexities of painting conservation, a function that happens behind the scenes without much public awareness. Elizabeth did a superb job of giving us an appreciation of this painstaking work." After the laboratory session, Roddy took us upstairs to the Renaissance galleries to view about a dozen selected paintings by Credi and other famous artists known to have worked in Verrocchio’s studio. Roddy provided a fascinating discussion of the varied skills and the relationships among the painters (master, assistant, friend) and what they learned from each other. The group lunched in the cafeteria under the plaza that features a wonderful waterfall just outside the glass wall. Discussion ensued concerning future mini-reunion possibilities in the area. 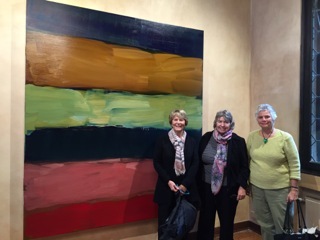 Following up on the art theme, Genya volunteered to set up a trip to the Cone Collection at the Baltimore Museum of Art, while Shirley and Missy agreed to organize future activities in the DC area. After lunch, some of us succumbed to temptation and bought things in the museum shops, happy to support the institution. ABOVE: MHC '63 gathered in the in the laboratory next to Piero di Cosimo's painting undergoing restoration. 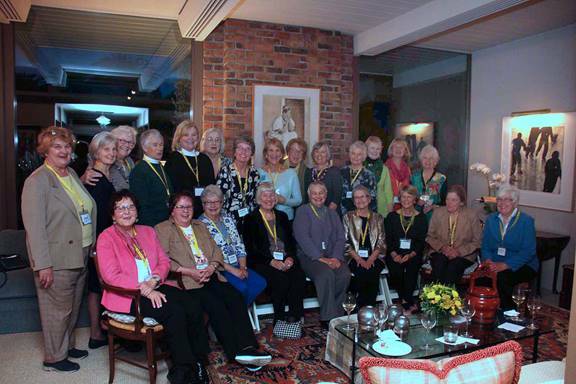 From left: Saint Anthony Abbot, Suella Weiland Henn, Genya Currens Hopkins, Nancy Welker, Shirley Trew Miller, Roddy Pratt Mack, Ruth (Bunny) Brown Gramlich, Missy Craig Parham, Hester Lindabury Ohbi, Kathleen Vreeland Buffon, Sally Nunneley, Caroline Keith. BELOW: Making plans over lunch. 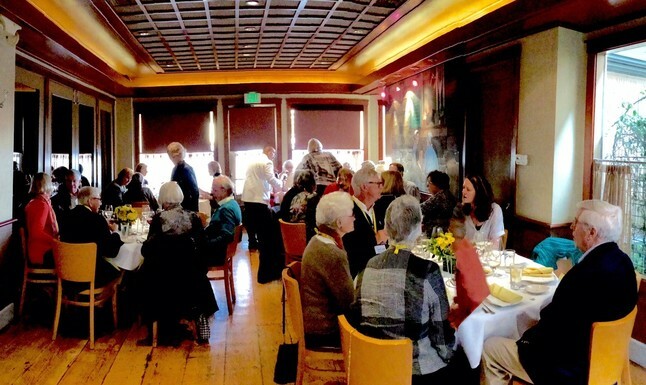 We had a wonderful mini-reunion luncheon in New York City at the University Club on March 20. 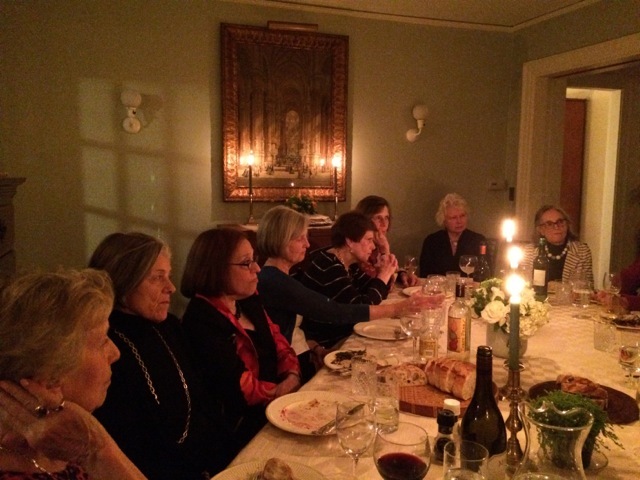 Sixteen of us came – Paula Freshman Kaplan, Nancy Selinka White, Joan Gagnebin Wicks, Diane Demont Rapp, Suzy Eberson Adams, Doris Mortenson Sisley, Alice Godfrey Andrus, Mary Jenness Raine, Susan Schindler, Pam Gold Oppenheim, Emily Miller d’Aulaire, Sara Panks Garretson, Ordway Clifford Sherman, Rayna Rosenberg Gillman, Arlene Anderson Johnson, and me – Susie Fickel Kroeger. The University Club (any graduate of a university or college can apply for membership), is a Charles McKim (of McKim, Mead and White, 1899) beaux arts edifice on the corner of Fifth Avenue at 54th St. An Italian Renaissance Revival structure, it is quite magnificent. The big reading room on the first floor looks like a New Yorker cartoon of old white males (overweight) dozing in chairs by very tall windows looking out on Fifth Avenue. I hasten to add that the Club is now thoroughly co-ed in membership. The library is embellished within an inch of its life in Renaissance mural style. 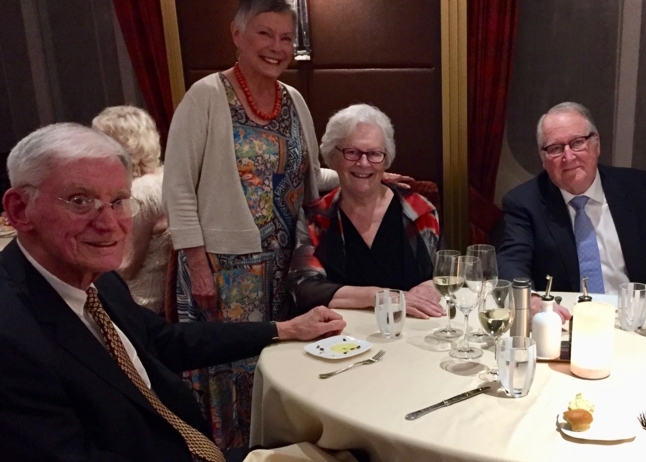 We met in two private dining rooms on the 9th floor, all to ourselves, and had a delicious three hours of talk, laughter, and reminiscence along with a delicious buffet lunch and wine and charming arrangements of daffodils on the two tables. Afterwards five of us (Paula, Nancy, Doris, Suzy and Alice) ventured across the street to the Museum of Modern Art to see the Gauguin show which I hear was glorious. Others dispersed as they wished. Alice gave an excellent and lively State of the College update on things taking place on campus. She and I had just recently been there to attend a fund raising meeting, and had a chance to tour the Art Museum to see the El Anatsui show, which is quite amazing and worth Googling. From Ghana, he uses bottle caps and bits of soda cans and other metal detritus to create fabulous fabric-like huge pieces held together with copper wire (one needs a tetanus shot to install his work). He is currently very “hot” in the art world, and it is a coup that we got this show. Do see it online. 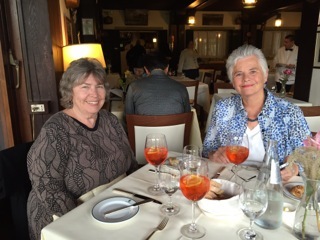 Coincidentally, there is a new President of the Alumnae Association just now in place, and it so happens that she is a very good friend of Arlene’s from her days at Catalyst – small world department. Now we have what you might call a Friend in Court. Altogether we had a lovely day and unanimously hope to repeat it soon in another interesting location. There are around 50 classmates in the metro NYC area, so hopefully we’ll attract even more next time.